knows us; we relish everything about this time of year. Here are just a few facts about our family: Our dog’s name is Hocus Pocus. We were married Halloween weekend. We have 2 black cats, one grey cat, and an orange tabby (who’s shaped like a pumpkin). As much as I appreciate every detail of this time of year, our animal companions do not. Our orange tabby is the very definition of a Scaredy Cat. Our dog is the Canine Defender of The Castle. Our grey cat rules them all, and does not like disruptions of any kind. All things added up; Halloween night is an assault on their senses. It’s a very good thing that I have learned a few “tricks and treats” over the years to help them all stay safe and comfortable during this festive night! So I created this post to share what I have learned with you! If your frisky feline or peppy pooch has a bad habit of door darting (like our black cat, Mr. Beaux used to do), Halloween night can be a real challenge. The best way to avoid this from happening is to place the escapee in their own separate, quiet room to prevent the chance that he/she has a chance to slip out the door as you’re offering treats to your costumed guests at the front door. 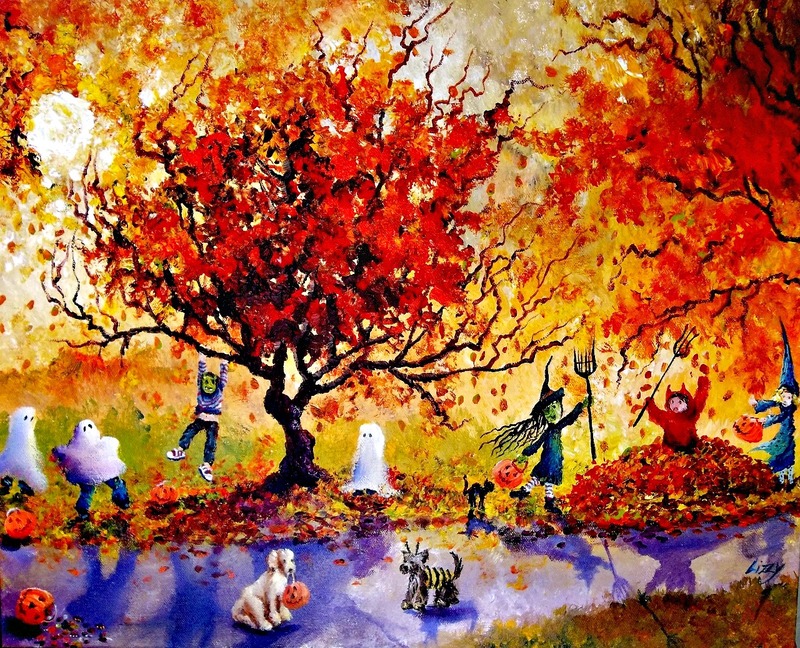 If the weather permits, think about setting up chairs on your lawn or driveway and pass out treats there! We do this every year now, and this “trick” cuts down on the constant pounding on the door, which is upsetting to any animal. 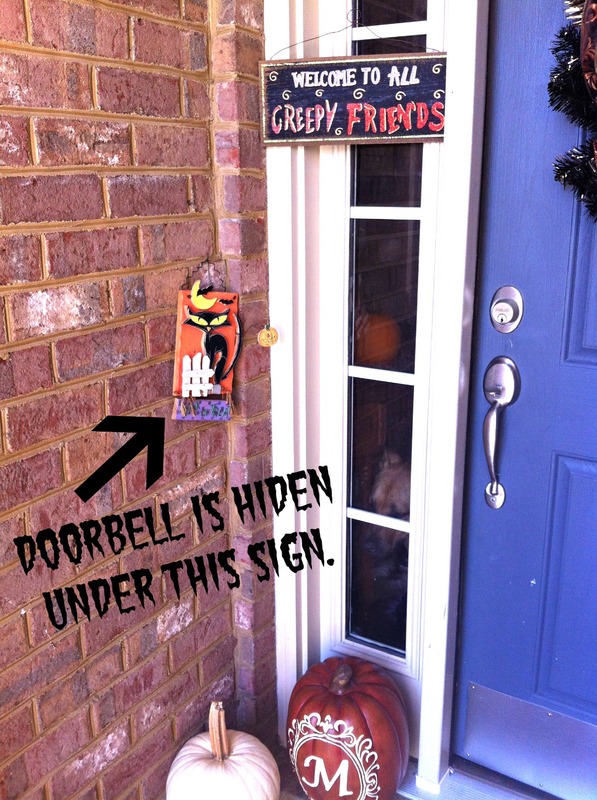 If it’s too cold where you live and you can’t set up Halloween Candy Camp in your driveway, you can avoid animal freak-outs by doing something very simple: Cover the doorbell. 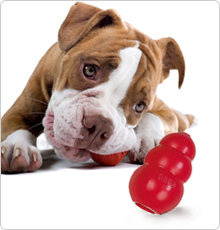 Cover your doorbell to reduce your pet’s stress! Halloween TIP: If you’re not going to be home on Halloween night, turn off your lights!! Everyone knows that a dark house means no candy, and that means you will avoid the congo line of costumed kids banging on the door all night, and upsetting your furry or feathered family members while you are gone. If you still want to give out candy when you are not here, cover the doorbell and put up a sign that says “Please DO NOT knock!”. Then leave out a bowl of candy with a sign that reads, “Please take one and leave some for the rest of the ghosts and ghouls!”. Keep Halloween Candy Away From Your Pets! 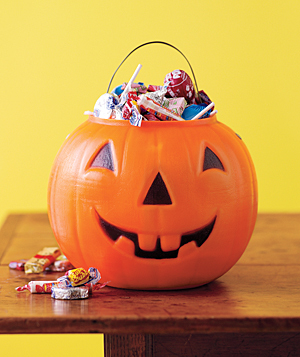 Keep candy far out of reach of the animals! Dogs will eat almost anything. Cats don’t have a sweet tooth, but that doesn’t mean that they won’t try to gobble down goodies that are left out. (We all know that anything left out is a personal offering to a cat). 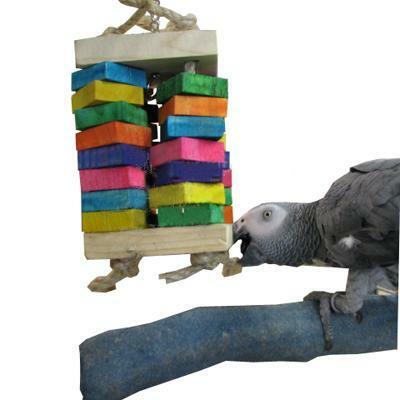 Birds are just as inquisitive as cats, so birds check things out with their mouths – including candy. Chocolate is deadly to pets. It contains theobromine, which can cause nerve damage and even death. The darker the chocolate, the more concentrated it is — and the smaller the lethal dose. Explain to everyone in your home how dangerous treats are to animals. Place the kids’ candy supply somewhere well out of reach of pets. Caution your children about leaving candy wrappers on the floor. Candy wrappers and candy can cause choking or a blockage. Xylitol (found in gum and many candies) can cause an increase in insulin in the body and can also lead to liver failure. Be a Conscious Companion by keeping the bowl of candy for the trick-or-treaters well out of your animal’s reach. Why take the chance? Fun for kids, Scary for our pets! You may enjoy watching your kids goof around and run amuck in their Halloween costumes, but your animal companions may have a very different reaction. Birds, cats, and dogs can become very frightened when they see their normal looking human walk into the bedroom and then later walk out as a monster. 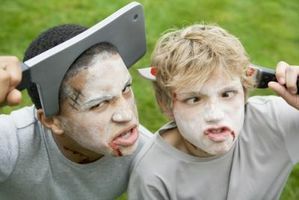 Please discuss with your kids or partner (well ahead of time) about how acting out the part of their Halloween character can be quite terrifying to the animals. Have your kids show the costume to the animal before they put in on. Better yet – let the animal watch them “transform”. 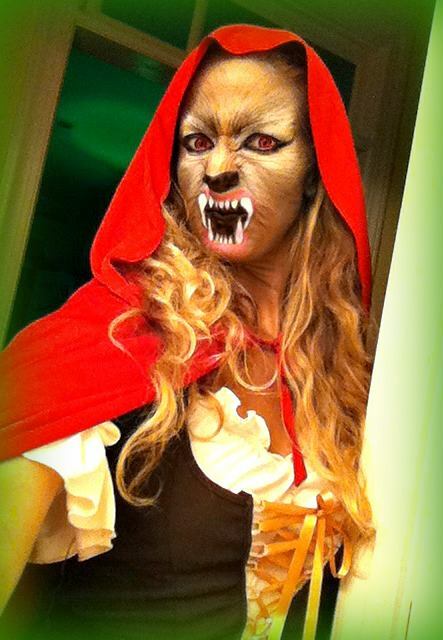 I used this technique with the cats and Hocus Pocus when I transformed into a Red Riding Hood Werewolf last year. Can you imagine the animals’ fright if I had walked into the bathroom as plain-ole-me and walked out as this monster?! Please ask your kids to think about how they can still have fun, but be conscious of their animal companion. If the pet is still frightened of the costume, you can pair the animal’s favorite treats or toys with your child or significant other in full (or even partial) costume. If the animal is still clearly afraid, place them in the other room during the costume parade so everyone can have a good time. 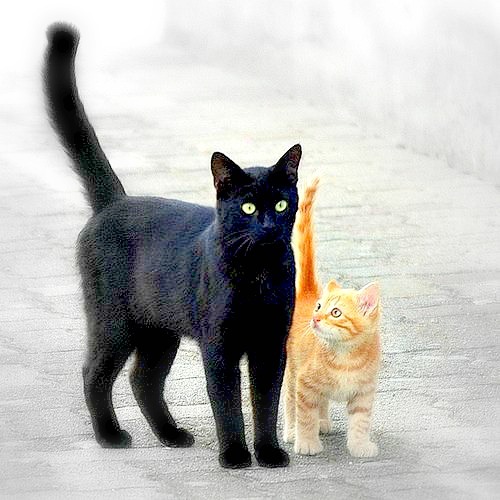 Me and my hubby on All Hallow’s Eve – We made sure the critters saw us transform, to prevent scaredy cats and canines! Ask your kids and other adults to avoid getting in the your pet’s face. This may just be a playful attempt to spook your pets, but any animal that sees his or her family members dancing around in crazy costumes, screaming loudly can easily start to feel fear and anxiety. What your kids and your significant other may see as good-natured fun can easily cause anxiety for the unsuspecting sensitive animal. As you visit Fall places with your pup, remember to be aware of their stress levels. For example, sheck out this pic of me & Hocus Pocus.🎃 I’m having a blast at the pumpkin patch, but she is not. She doesn’t want to be up there with people staring at her. She’s clearly uncomfortable. And like most dogs, she doesn’t like cameras in her face. So we ended the photo sesh quickly and let her run around and sniff to blow off her stress. 🔶How do I know she’s not feeling cool, confident, and comfortable in the pic? Check out her mouth. She’s about to offer a yawn. When a dog yawns, the dog may not be tired. The dog could be displaying signals that she is stressed, conflicted, or frustrated. Hocus is doing just that by trying to tell us that she is uncomfortable at this moment. 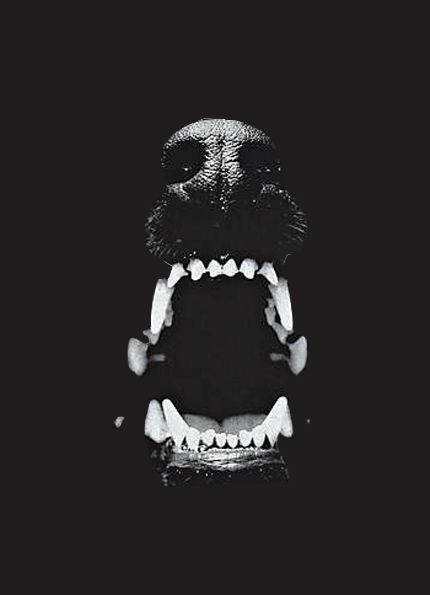 Read more about how you can decipher the canine clues here! When it comes to pets and costumes, please consider their feelings and sense of safety. Please refrain from dressing your pets up in ridiculous costumes. It can be very stressful to them, and it’s often not safe. If you really feel the need, take a quick picture of them in the costume, then let them go on their way in their natural fur suit. Halloween Tips That I Have Learned Over The Years! Tricks and Treats That Help! Give them things to chew on and play with to occupy them while they are in their “safe hideout”. Reduce Noise: Cover the doorbell so it’s not ding-donging all night! White Noise: Turn on classical music or animal-friendly T.V. shows to muffle the noises outside. Exercise: Get your pets T I R E D before Trick-Or-Treaters arrive! If they are happily tired from healthy play and exercise they are less likely to be on alert and energetic all night. Rooms of Refuge: Be sure they have a room to hide in that’s safe and quiet! Calming Drops: Applying a few drops of Pet Rescue Remedy, Spirit Essences, or Homeopet to their food, water, or mouths will help them relax. 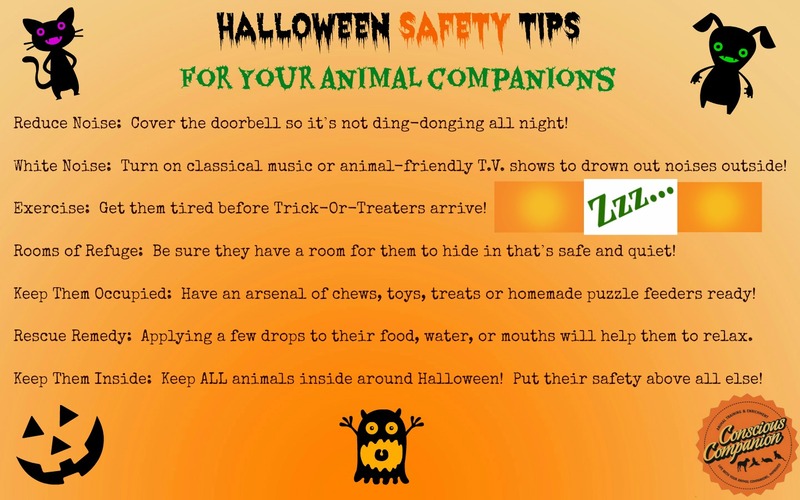 Keep Them Inside: Keep ALL animals inside around Halloween! Having to temporarily endure your animal’s vocal complaints is nothing compared to risking his or her safety. Check out the 12 Reasons to Keep Your Cat Indoors! Desensitize Well Beforehand: If you know that your animal is reactive to doorbells or door knocking, you can learn how to Keep Your Dog Calm When the Doorbell Rings. Please note: Halloween night isn’t the time to start working on polite greetings, “quiet” commands, or acceptance of masks and costumes without any prior exercises! Have a Happy Halloween … Without Havoc! 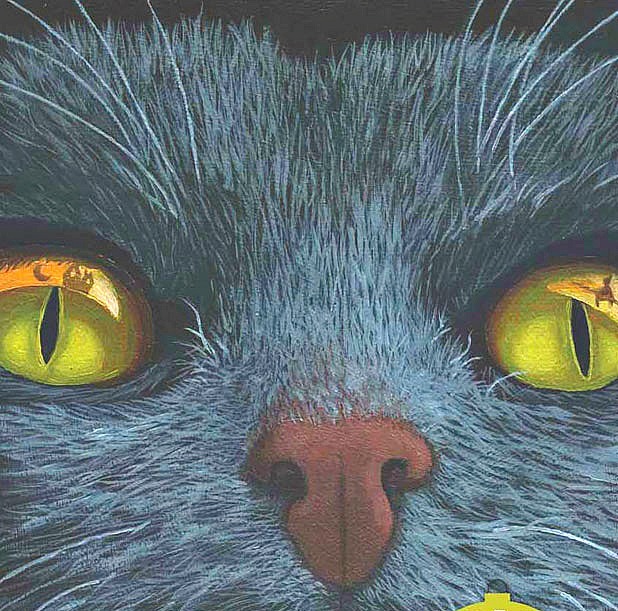 Do you have tricks and tips that have worked for you and your animal companions on Halloween night? Please share your suggestions in the comment section below! Together we can help to make Halloween Havoc-free for ourselves and our animal companions!